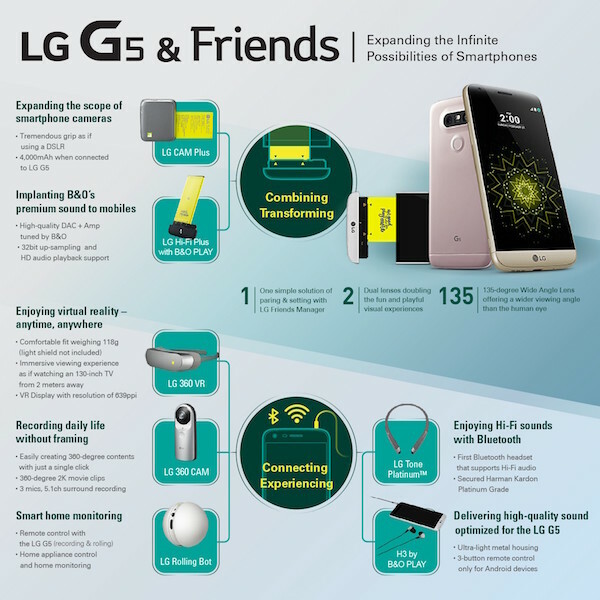 LG has officially announced the new G5 smartphone at an event that took place at Mobile World Congress in Barcelona. The new smartphone, which aims to take attention away from Samsung’s Galaxy S7, features all the bells and whistles that you might expect from a modern, flagship Android device as well as one very particular game-changing addition that you might not. 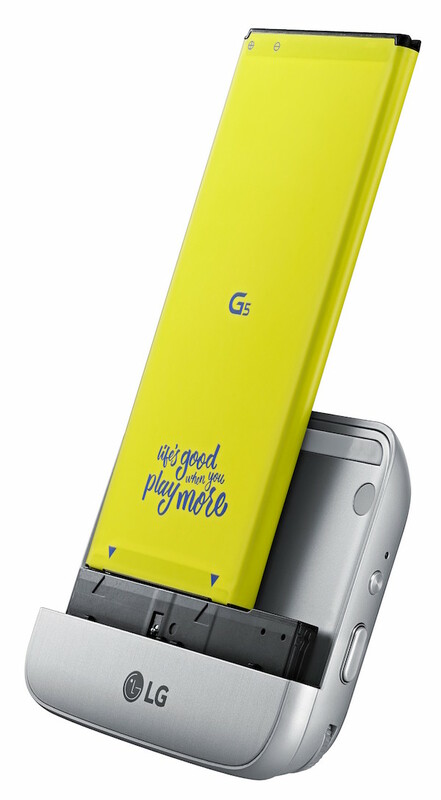 Getting to the most interesting of the features first, LG’s G5 is basically a modular smartphone featuring a slide-out expansion slot that makes it possible to attach all kinds of things to the device, with LG calling these additional pieces of hardware ‘LG Friends.’ Awful name aside, these things range from B&O module for adding Hi-Fi music, a camera module for adding DSLR-like capabilities to the phone, swappable batteries, shooting 360-degree videos, VR, to accessories carrying the Parrot name – that’s right, the people behind the super popular drones. Right now there are a handful of LG Friends that have been shown off, but LG promises that more are on the way. Juno Cho, CEO of LG, took to the stage to announce just why LG Friends exist in the first place. Today’s consumers are just looking elsewhere – such as at action cameras or drones… But here at LG we believe phones are way too powerful to just take pictures and post them on social media. 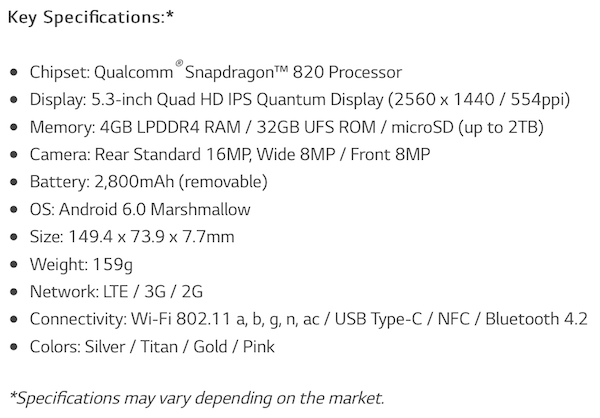 The arguably more mundane details that you will need to know about the LG G5 are that it features Snapdragon 820 CPU with Adreno 530 GPU, a 5.3-inch screen with a 2560×1440 resolution, 4GB RAM, and comes with 32GB of internal storage which can be increased thanks to the built-in microSD card slot. Charging the 2,800mAh battery is taken care of by a USB Type-C connector, and battery use has been thought of on the software-side too. 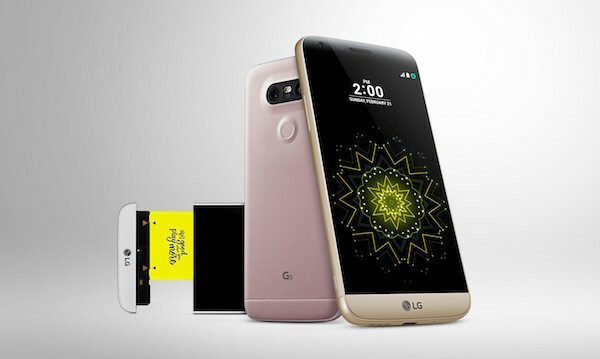 The LG G5 features an always-on display for clock and notification system that uses almost no battery life, similar to those offered by other manufactures such as Motorola. Apart from all this, there’s an onboard 16MP wide-angle rear shooter while on the front we have 8MP sensor for selfies. The LG G5 and its LG Friends will be available in a range of colors (Silver, Titan, Gold, Pink) globally at some point in April this year, we’re told. LG hasn’t announced any pricing for G5 yet but we expect it to be same as G4, coming in at $599 for the entry level unlocked model. We’ll update you guys on the price and release date info as soon as we hear more from LG on this. Stay tuned. I really like this phone. Staying with my v10 tho. Tablet size, Android OS..Pass..Sticking with iOS JB, 4”. Really liking the modular design. Think I just might give this a try. The new Snapdragon 820 is trailing the old A9/A9X in performance. Can’t see this being popular to be honest! !